While most months are traditionally associated with one gemstone – September with sapphires, for example – October is one of the few that has two birthstones. 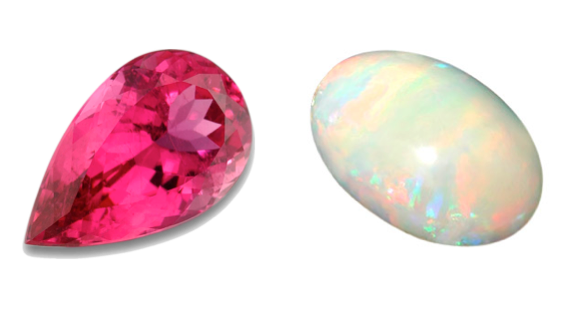 Opal and tourmaline are two very different gems, offering those born in October a choice – over which speaks most to their unique tastes. 2. Opal is best cut as a cabochon to show the best colorplay. 3. Opals can sometimes be double sided with different color on each side. This makes a very unique gemstone. 4. The origin of the name Opal is derived from the Latin word "opalus" which means "a stone"
5. Opals are formed from silicon dioxide and water, so it’s safe to say opals are formed by rain! As water runs down the earth and evaporates, it leaves behind silica that dries out and creates beautiful opals. 6. 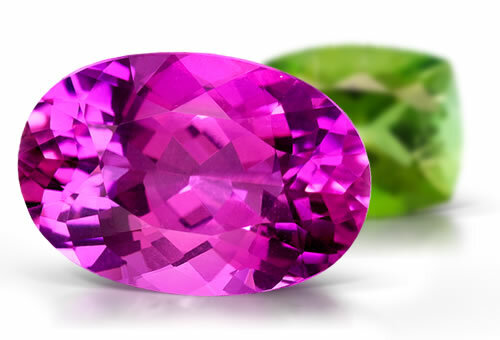 The first recorded tourmaline was a green crystal discovered in 1554 by a Spanish explorer who thought it was emerald. 8. Tourmaline comes in many colors: blue, green, orange, pink, purple, red, yellow, brown, black, and even colorless! 9. Tourmaline comes from toramalli, which means “mixed gems” in Sinhala, one of the languages of Sri Lanka. 10. Although it can be found throughout the world, the significant Tourmaline mines are located in Afghanistan Pakistan, Russia, Burma (Myanmar), Sri Lanka, the United States (California and Maine), Madagascar, Namibia, Mozambique, Tanzania, Nigeria, and Malawi. Truly fine quality Tourmaline gems are rare and expensive.